The Sukhothai was an early kingdom in the area around the city of Sukhothai, in north central Thailand. It existed from 1238 to 1438. Thailand was under the Funan and Srivijaya Kingdoms before the migration of Thai people because of pressure from the Mongols. They were compelled to leave Nan Chao in Yunan. The formative stage of Thailand’s history began with powerful monarchs operating from Sukhothai on the banks of the Mae Nam Yom River. The kingdom of Sukhothai’s predominance was due to the fact that it had tremendous potential for agricultural production. It controlled water resources for the entire Menam Basin as it was situated at top of the main flood basin. A surplus of food made it possible to have a large army. Sukhothai was one of the early kingdoms that emerged in Thailand and Laos integrating the traditional muang administration with the Indian mandala concept of a centralized state. It borrowed art forms and administrative structure from the Khmers. Mongol influence was evident in military units. Legal traditions came from the Mons. In spite of influences from India, Sri Lanka, and neighboring regions, Sukhothai evolved its own cultural pattern, maintaining its identity. 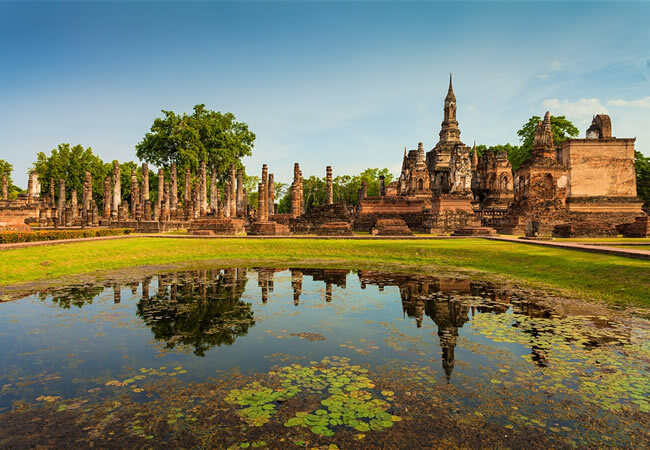 The legacy of Sukhothai was their language, script, and religion, which became an essential part of Thai culture. The local Thai princes Pho Khun Bang Klang and Pho Khun Pha Muang revolted against Khmer rule, establishing independent regimes. Klang became the king of Sukhothai with title of Sri Indraditya (r. 1238– 70) and was succeeded by his son Pho Khun Ban Muang (r. 1270–77). The regime expanded under the younger brother of Rama Khamheng (1239–1298), who ruled from 1277 until 1298. Rama Khamheng or Rama the Great was one of the greatest monarchs of Thailand and at the time of his death left a vast kingdom. He adopted both diplomacy and warfare to expand Sukhothai’s domain. Their stability was assured by a friendship with China. Many important facets of Thai culture developed under his reign. The Mons, Khmers, Indians, and Sri Lankans had close cultural contact with Sukhothai. The Sri Lankan variety of Buddhism (Theravada Buddhism, also known as Lankavong) became predominant in Thailand. In continuity with the indigenous tradition of worshipping spirits, Rama Khamheng continued to make offerings to Phra Khaphung, the spirit deity located on a hill south of Sukhothai, even after adopting Theravada Buddhism. Thus two religious traditions were merged. Rama Khamheng was the originator of Thai script. The Thai alphabets invented by him are basically still in use, with modifications. The reign of Rama Khamheng, the warrior and benevolent monarch, is rightly called the golden period in Thai history. After the death of Rama Khamheng, his son Lao Thai (r. 1298–1346) ascended the throne. The kingdom of Sukhothai faced challenges from rising Thai states and Lao Thai was not very successful. Decline of the kingdom began and later rulers could not check the process of disintegration. There was a struggle for power after the death of Lao Thai and Nguanamthom ruled for some months. Lao Thai’s son Luthai ultimately became the ruler with title of Mahathammaracha I (r. 1346–68). A great scholar and patron of Theravada Buddhism, he was more involved in religious affairs. He did not pay much attention to the affairs of the state. The emergence of the powerful Lan Xang kingdom in Laos and Ayutthaya in southern Thailand resulted in loss of sizable territory of Sukhothai. Fa Nagum established the first unified state of Lan Xang in 1353. The kingdom of Ayutthaya, founded by Rama Tibodi in 1350, dominated Thai power and culture for four centuries. Neither Mahathammaracha I nor his successor Mahathammaracha II (r. 1368–98) could check acquisition of Sukhothai territory by Lan Xang and Ayutthaya. In 1371 Borommaracha I (r. 1370–88) of Ayutthaya, bent upon a policy of doing away with his Thai rivals, invaded Sukhothai and captured several towns. Four years afterward, the important town of Phitsanulok fell to the Ayutthaya king’s army. Sukhothai became a vassal state of Audhya in 1378 after 140 years of independent existence. In 1400 there was a flicker of hope for Sukhothai, when Mahathammaracha III (r. 1398–1419) declared independence from Ayutthaya’s subjugation. It was suppressed and Ayutthaya installed a new king, Mahathammaracha IV (r. 1419–38). Phitsanulok was the new capital of a much smaller Sukhothai. It became a province of Ayutthaya after the king’s death. The princes of royal families generally became the administrators of the Sukhothai region.